Our professionally crafted janitor resume sample will put you on the path to getting you the best position available. Download for free, copy and paste, or simply use ours for reference. Or, if you’re short on time, try out our easy-to-use resume builder. Looking for a different job? View our full list of resume samples. Prefer a different template? 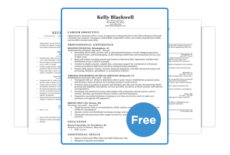 You can choose from many other free, downloadable resume templates here. There are other ways to compose a resume for a janitor – if you want to know more about different resume formats, read about them here. Also, check out our Janitor Cover Letter Sample below, and the sample for maintenance workers as well. Or, if you need additional advice, check out our library of excellent cover letters for a push in the right direction. Important job skills: Basic carpentry, plumbing, and equipment repair skills, proficiency with power and hand tools, and experience with cleaning equipment including buffers, power washers, etc. Janitors with some experience under their belts often also have a range of specific skills and certifications. If this is the case for you, we recommend using the combination format. Experience is certainly an important feature if you are a janitor. Still, working at one place for 10 years is not as attractive as hiring someone with an HVAC certification who only has five years under his belt. An HVAC certification is not necessary to be a janitor, but if you have this certification you will be better paid and in higher demand. The course takes at least 6 months of part-time study to complete. With your HVAC cert, you become much more of an asset to any organization. Having one shows you are capable of fixing some of the biggest headaches in a facility. There are a range of certifications available for janitors and cleaners. These include carpet cleaning, mold inspection, green cleaning, and bloodborne certifications. Having these make you eligible for work at places like medical facilities, public buildings, and larger companies. They also mean you can ask for higher pay. For a list of janitorial-related cleaning services, check out the International Janitorial Cleaning Services Association. What you’ll emphasize on your janitor resume depends largely on where you are in your career, what certifications you have, and how many jobs you’ve had in the past. If you have certifications and specific skills, make sure those take priority. Furthermore, if your work history is spotty or you’ve jumped from job to job, place your skills and professional profile closer to the top. However, if you don’t have a lot of certifications but have a strong work history, like years with a good company or experience in a place like a hospital or factory, your work experience might say more. It’s up to you to decide how to format your resume. If you need help, see our resume formats, templates, and writing guides.